Retailers visiting BIXOLON at the NRF Show (Booth #1403) will see the latest mPOS printing solutions in action and get a sneak peek at innovative mobile products coming in 2018. 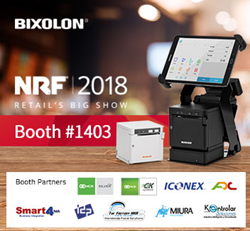 BIXOLON America, Inc., a leading global mobile, label and POS printer manufacturer, will showcase its latest compact mobile point-of-sale (mPOS) printing solutions at the National Retail Federation (NRF) Retail’s BIG Show, January 14-16 in New York City. At the heart of the lineup is the company’s new, space-saving cube printer series, including an intelligent hub model with tablet stand for flexible and cost effective “build your own mPOS” applications. SRP-Q300 Series: Designed for retailers looking to support “click-and-collect” transactions, BIXOLON’s 3-inch thermal MPOS cube printer enables flexible mPOS receipt printing from Android™, iOS™ and Windows® mobile devices. Featuring BIXOLON’s intelligent B-gate hub technology, the SRP-Q300H model supports a range of accessories—including tablet stand, LCD customer display, card reader (MSR/SCR) and more—transforming it into a complete “build your own mPOS” solution. It connects to mobile devices via Bluetooth or Wi-Fi wireless communication while supporting a charging port and up to four USB peripherals. Designed to speed integration of mobile and online order printing from native, web and cloud-based applications, the SRP-Q300H is ideal for ISVs and developers looking to design their own POS environment, without the time and cost of developing peripheral drivers. also includes BIXOLON’S exclusive Label Artist™ Mobile software for fast and easy label design and printing from iOS and Android devices. SLP-TX400R: BIXOLON’s new 4-inch desktop label printer with RFID technology, the SLP-TX400R supports both direct thermal and thermal transfer printing. It simultaneously prints and embeds UHF RFID code into hang tags, inventory labels, wristbands, loyalty cards and more, making it an ideal choice for retail, warehousing and logistics applications. BIXOLON will host complementary hardware and software technology partners, including NCR Silver, Applied Data Corporation, Kontrolar, The Factory HKA, IDP and Miura Systems. BIXOLON printers will also be showcased at partner booth locations including Iconex, featuring the SRP-S300 and SPP-R310 printers in restaurant linerless labeling applications, Smart 4 B&R, showcasing an OXXO fuel dispenser with integrated SRP-Q302 receipt printer, and C&K Systems, showing an NCR CounterPoint all-in-one terminal with SRP-350plusIII receipt printer and SLP-DX220 label printer. BIXOLON is a leading global manufacturer of innovative, advanced printing technologies including point-of-sale receipt, label and mobile printers for a wide range of environments. Millions of BIXOLON printers are used today in retail, hospitality, healthcare, banking, ticketing, post/parcel, warehousing and other transaction-intensive industries. In 2017, for the fourth year in a row, BIXOLON was named global mobile receipt printer market leader by Japanese research company Chunichisha, securing a 32.9% market share. For more information, contact us at http://www.bixolon.com, or follow us on these social channels: Twitter, Facebook and YouTube.